B.Sc. Construction Management is a three-year undergraduate program in the domain of managerial application in the context of the construction environment. The minimum eligibility criterion which most of the institutes ask for is a score of at least 50% (relaxable for reserved category candidates) at 10+2 or equivalent level. Those who have done diploma or any certification course after class 10th can also apply for the course (if they fulfill other eligibility criteria). Those with a 3-year diploma after class 10th (10+3) can apply for admissions in the 2nd year of the course (Lateral Entry). The average tuition fee charged for the course in Indian colleges/University ranges between INR 10,000 to INR 3.25 Lacs and depends upon the nature of college/institute (that is government, state/private/deemed) as well as its location. Admission to B.Sc Construction Management course involves a Common Entrance Test (CET) based selection method as well as merit-based selection criterion that is the percentage of marks obtained at 10+2 or equivalent level by the candidate. Colleges and Institute that provide admissions through CET mechanism rely on the score of University level common entrance test or go for a separate entrance exam of their own. The course aims to apply the managerial principles and techniques in construction and development pretext with a scientific and logical outlook for the same. The course covers all the relevant aspects of the subject in a wholesome and holistic manner. The subject matter of the course provides a complete overview of all the aspects related to the subject. Candidates completing the course successfully can expect job offers ranging from INR 15,000 to 20,000 per month. 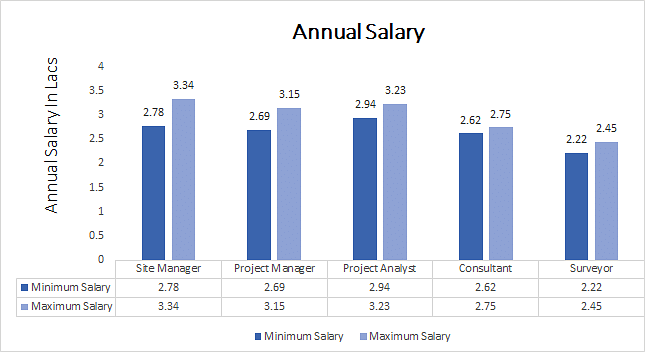 The annual salary goes beyond this average bracket with enhancement in the skill set and experience of the candidate. Eligibility Minimum score of 50% (Relaxable for reserved category students) marks at 10+2 or equivalent level. Top Recruiting Companies L&T, Reliance Infrastructure, BLK, GMR group, IRCON International Ltd.
Job Positions Site manager, Construction engineer, Surveyor, Project manager, Project Analyst, Consultant etc. B.Sc Construction Management: What is it about? Construction is a process related to development and rebuilding of physical infrastructure for enhancement of economic growth. The process of construction by its very virtue of involvement of a large amount of expenditure and workforce requires the application of effective managerial skills. Efficiency in the process of construction is induced by sound management of both capital and workforce. To bring in these managerial practices in the domain of construction there is a need for them to be incorporated in a scientific and defined manner. For this purpose, a qualified and skilled manpower in the respective domain is a prerequisite. B.Sc Construction Management is aimed at providing domain-specific skills and knowledge to the students through academics and practical approach. The course is structured in a manner so as to access and develop academic base through semester-wise theoretical examination while developing the practical skills through lab modules, experiments, and research. At the core of its operation, the program aims to bridge the gap between industries demanded and supply of qualified and able personnel in the domain. B.Sc. Construction Management is offered as an Undergraduate (UG) course by a good number of colleges and universities across the country to candidates who have passed their 10+2 or equivalent level examination from a recognized state or central board. He/She shall not be having any Supplementary or Compartment in any of the subject/Subjects at 10+2 or equivalent level that is yet to be cleared at the time of taking admissions. Institutes offering admissions through Common Entrance Test go for scores of respective University based examination. To get admissions in these universities/institutes candidates would have to qualify the respective entrance exam by securing minimum qualifying marks. The eligibility criteria’s mentioned above are common to most of the universities and colleges across the country that are offering B.Sc. Construction Management this course to the students. Admission to B.Sc. Construction Management course is done through the merit-based mechanism as well as common entrance test based admission process (as seen across various Universities and colleges in the country). For more clarification and ease of understanding please, take a look at the below-mentioned points. Students who have passed their 10+2 or equivalent level (Diploma) examinations with a minimum of 50% marks (relaxable for reserved category students) can make application in colleges offering the course. Majority of the Universities/Colleges conduct a common entrance test for admission into B.Sc. courses or take admissions through the merit-based procedure. Students have to qualify the entrance exams (for which they should be eligible to appear) in order to get admission in the course. After completion of all the process, final allotment of seats to the candidate takes place and the candidate is asked to deposit the fee for the course and register for the respective academic year. Admission process would more or less be same across all the colleges and universities that are offering this course. The syllabus of B.Sc. Construction Management course is divided into 6 semesters spread over a span of three years. End Semester Exams being held after each semester. The syllabus of the course is divided into various subjects and practical modules that students are taught during the course of their under graduation. The syllabus covers all the aspects related to subject in a holistic manner. The details regarding the syllabus of the course are mentioned below so, as to provide a reference to the candidates. B.Sc. Construction Management: Who Should Opt for? B.Sc. Construction Management undergraduates have plenty of options to choose from in terms of their career. One can choose to work as Site Manager, Construction Engineer, Surveyor, Project manager, Project Analyst, Consultant etc. To provide you a holistic view of the career prospects of the course we have tabled certain areas and the respective roles attached to the same where Construction Management undergraduates can look for in terms of their career.